StickerZone are specialists in producing printed and personalised stickers. Based in the North East of England, the company has many years experience in the print and design industries. With our many years experience in the industry we pride ourselves on the excellent personal service we offer our customers and guarantee high quality professional products in all areas of our business. Our high quality products coupled with our excellent customers service and care make us the best choice for both printed and personalised stickers on the web. Payment can be made with a credit/ debit card or PayPal account. This offers our customers a secure platform to purchase our products and ensures buyer confidence. 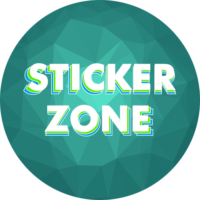 StickerZone uses Royal Mail delivery for all of their orders to allow for quick, reasonably priced delivery. Any purchases using the express delivery option will be sent next working day from receipt of correspondence for personalised stickers and next working day for printed stickers. Buyers are advised to choose the express delivery option on personalised stickers if they knew the exact specifications you require. StickerZone will accept no responsibility for late delivery caused by lack of buyer specifications. Delivery will be made to the address advised in your order unless otherwise stated.